Two summers ago, my husband and I were just getting home from work, and we were very hungry. This was one of those days with temps in the 100s, and we were tired, hot, and HANGRY. We hopped on Yelp, did some searching, and found a few potential options. We called one and asked if they had vegan options. The worker who answered the phone replied, “Vegan? What’s that? I mean yes, we have vegan options.” We said thanks and then ruled that place out. The next place we called, Everest on Grand, said they have vegan options, but their AC went out earlier that day. Needless to say, we didn’t visit there, at least not that day. Finally, we called Thai Garden. Ginger, the hostess answered and happily shared that they have vegan options—and air conditioning! So off we went, into the blistering heat for our journey. 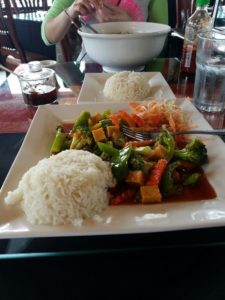 Not expecting much, we arrived and proceeded to enjoy the best Thai food that we’ve had in the Twin Cities. Chef Long is at a point where he can make nearly every dish on the menu vegan, and it all started with us searching for a place to eat on a blisteringly hot summer day. The best vegan dish you’ll find here is the Vegan Pho, which comes with homemade vegetable broth, thin rice noodles, veggies, and fried tofu. There’s also the Pad See Ew, a wide rice noodle dish with Chinese broccoli and fried tofu in a homemade vegan brown sauce. Hold the eggs! Similar to the Pad See Ew is the Drunken Noodle. Google where the name came from—it’s hilarious! It’s a similar dish, except that the bell peppers are the stars in this dish. Once again, hold the eggs. Their most popular dish is of course the Pad Thai. Leave off the eggs and this dish is otherwise naturally vegan. If you have a peanut allergy, no problem. They just won’t garnish your dish with them. If you’re a curry lover, you have five curries to choose from, even a curry Pad Thai. All of their regular entrées along with their fried rice dishes can be made vegan. I would happily go on and on about their vegan options, but I hear your stomach grumbling. Just go on over and check them out. I assure you that you won’t be disappointed! Join CAA for the April Dine-Out at Thai Garden on Wednesday, April 18.